Brandon Turkus March 20, 2018 Comment Now! Chocolate eggs, jelly beans, and Peeps (gross) are on the shelves, which means it must be time to start talking about the 2018 Easter Jeep Safari in Moab, Utah. 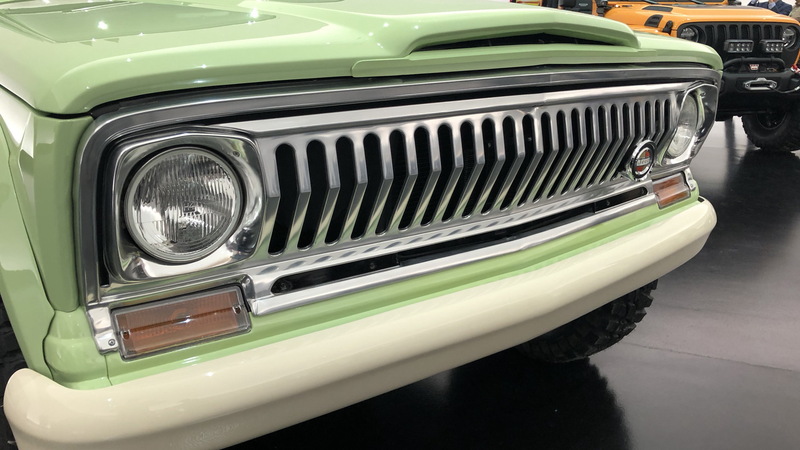 As is tradition, Jeep is bringing a flotilla of one-off concepts to this year's event and the selection is typically eclectic, mixing impressive craftsmanship with a spread of the company's Mopar-branded aftermarket bits. There are seven vehicles in this year's showcase, and as is usually the case, the newest Jeep models take center stage. That means even more modified Wranglers than usual. 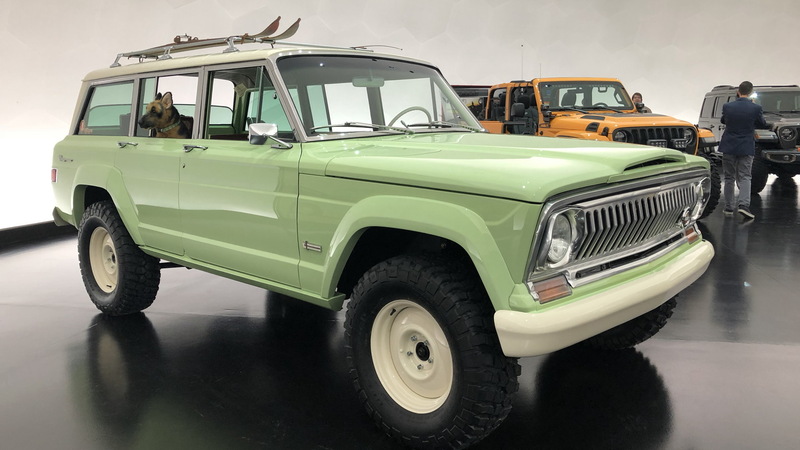 But while Jeep's iconic off-roader takes center stage, a restomodded Wagoneer from yesteryear and an adorable Renegade join it. We stopped by FCA's Design Dome to check out all seven concepts. Read on to find out more. 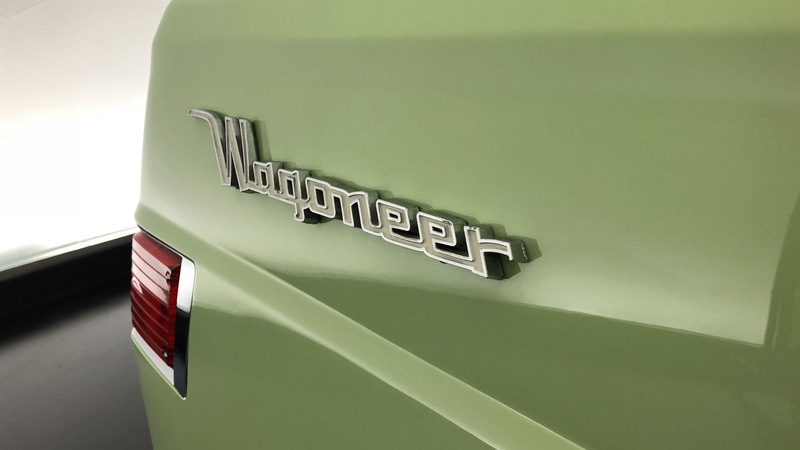 Did you really think we wouldn't focus on the Wagoneer first and foremost? 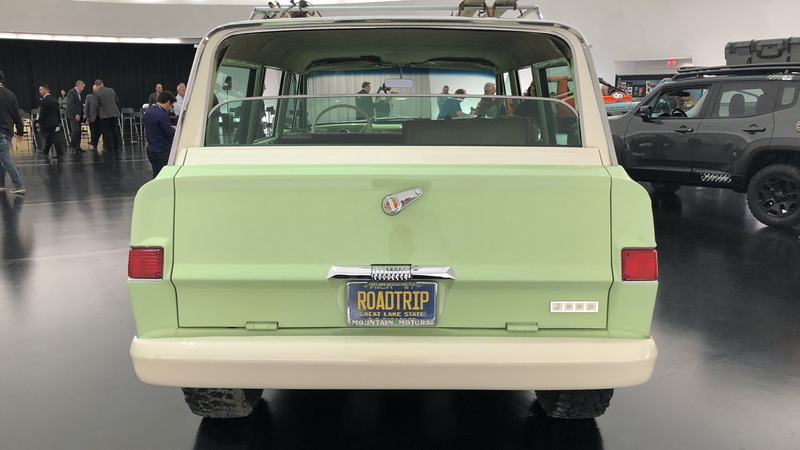 Wearing the (slightly modified) steel bodywork of everyone's favorite woodsided SUV, the Wagoneer Roundtrip boasts modern underpinnings… mostly. The 5.7-liter Hemi V-8 works alongside a 4-speed automatic, for a little bit of old with the new. Fore and aft Dana 44 axles with lockers and a four-link suspension with coilovers keep the Jeep flexible over rough stuff. Meaty 33-inch BFGoodrich Mud-Terrain tires on 17-inch steel wheels keep it gripping. While Jeep updated the internals, it also fiddled with that classic body. The biggest change is the extra five inches between the axles along with the wider track—this Wagoneer is undeniably bigger than its production siblings. Flared fenders and revised wheel wells fit the one-off Wagoneer's character and upgraded bumpers and rock rails ensure protection off road. What would happen if Jeep built a roadster? The 4Speed Concept attempts to answer that question, drawing inspiration from the Pork Chop and Stitch concepts and marrying it to a reduced curb weight, an aggressively raked windshield, and a 2.0-liter, turbocharged 4-cylinder engine. That weight reduction is thanks to the absence of most of the body work. Like the Pork Chop and Stitch, there is no roof, doors, or rear seats. The hood and fender flares are carbon fiber, as is the rear tub. The Wrangler-based concept's cage is custom and matches the aggressive rake of the windshield. According to Jeep, the weight savings is so dramatic, the 4Speed gains two inches of ride height over a standard Wrangler. Outside of the liposuction, Jeep modified the Wrangler body and trimmed 22 inches off the overall length. While that has a pleasant visual impact, it also improves the 4Speed's approach and departure angles. On the underside, Jeep attached Dana 44 axles, while 18-inch monoblock wheels are shod in 35-inch BFGoodrich Mud-Terrain tires. You know how the Ford F-150 Raptor is essentially a Baja racing truck with leather seats? The Jeep Sandstorm is that but a Wrangler instead of a pickup. The 6.4-liter V-8 crate engine works alongside a 6-speed manual transmission. But like the Raptor, the powertrain is only a tiny part of the overall equation. Jeep engineers scooted the front axle forward four inches and the rear axle back two, making room for a long-arm four-link front suspension, a four-link trailing arm suspension, and custom coilovers and bypass shocks. The result? The front suspension features 14 inches of travel, and the rear boasts 18 inches. The front and rear axles are Dynatrack 60s, and at each corner sit absurd 39.5-inch BFGoodrich Krawler tires on 17-inch beadlock wheels. Jeep's changes to the exterior are just as aggressive as its suspension changes. Designers started by adding vents to the hood and wheel arches while manufacturing both out of carbon fiber. Upgraded front and rear tube bumpers promise more durability and increased ground clearance and the modified cage, chopped rear doors, and missing rear gate give the Sandstorm a sleeker look. The cabin gets a number of purposeful changes, too. A custom roll cage provides protection, while leather front seats satisfy the “Baja vehicle with leather seats” brief. Jeep replaced the traditional gauge cluster with a race-inspired unit and a 7-inch off-road GPS system. Finally, Jeep ditched all the plastic trim and yanked out the carpet, replacing it with a bed-liner-like material. While it's now the second oldest vehicle in the Jeep lineup, the Renegade is still getting some love during this year's Easter Jeep Safari with the B-Ute. A play on the Renegade's internal code “BU,” it's a lightly modified tike with a 1.5-inch lift, a roof rack, and rock rails. Beyond those simple changes, Jeep added unique 17-inch wheels with a 30-millimeter offset and shod in BF Goodrich T/A Baja Champion tires. Tweaked front and rear fascias, a vented hood, and wider flares round out the exterior enhancements. There are plenty of aesthetic changes in the cabin, although the main functional upgrades focus on the MOLLE system on the back of the front seats. 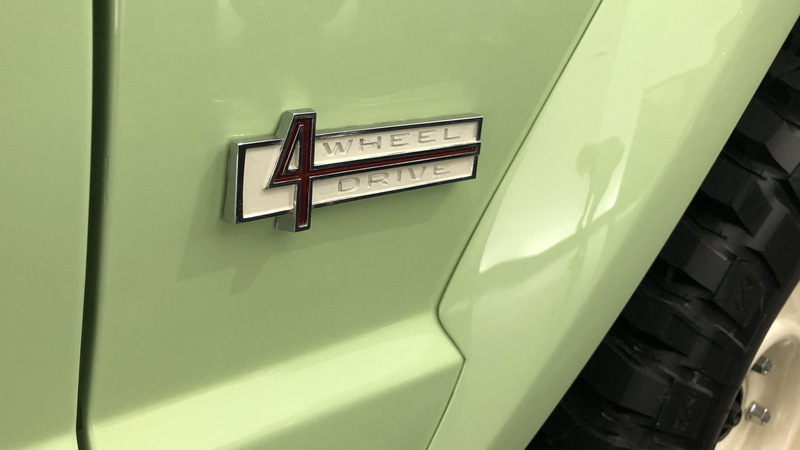 Jeep hasn't touched the B-Ute's powertrain, retaining the 2.4-liter 4-cylinder and 9-speed automatic. Awesome name aside, the Nacho Jeep is what happens when you order one of everything from the Mopar aftermarket catalog. Based on a Wrangler Rubicon and finished in Nacho Yellow paint, it's hard to figure out where to start. The Mopar parts catalog has touched nearly every element of this bright yellow Wrangler. The suspension wears a two-inch lift, while the Nacho Jeep features 17-inch beadlock wheels shod in 37-inch off-road rubber. But beyond those changes, suspension and axle mods aren't really necessary (the Nacho is based off the Rubicon, after all). Jeep pulled the Rubicon's stock hood and added one with a black graphic and a Jeep Performance Parts badge. The grille is new, finished in satin black, and it sits above a steel front bumper and a a Warn winch. Tube doors enhance the open-air feel while still providing a modicum of safety. The thicker and wider rock rails wear a grippy coating that Jeep says is similar to what the Ram truck brand uses for its bedliners. Additional lighting elements sit on the A-pillars, brush guard, and windshield, while an interesting rear LED setup can communicate trail positions – the four-color LEDs can switch from red for a stop, amber to call for 1 to 3 mph, or green for 3 to 25 mph, as well as switching to white and serving as a rear flood light. Based on a 2018 Wrangler Rubicon, the Jeepster takes its inspiration from the 1966 off-roader of the same name. Once again, Jeep chopped the roof and dragged the windshield rearward 2.5 degrees to give the profile a faster, more aggressive look. Half doors, the Rubicon's meaty fender flares, a prominent hood and graphic, extra lights on the A-pillar, and factory Rubicon steel bumpers round out the major updates. Naturally, there's a two-inch lift and 37-inch BFGoodrich KO2 tires. We're pretty sure those are just prerequisites nowadays. The tires surround 17-inch beadlock-capable wheels that match the Firecracker Red body work. In the cabin, Jeep added a concept roll cage and a spare tire carrier occupies the space where the rear seats should be. Katzkin leather lines the seats, while there are a number of trim touches to complement the red bodywork. Another product of the Jeep Performance Parts catalog, the J-Wagon starts life not as a Wrangler Rubicon, but as a Wrangler Sahara. It's the only vehicle in this flock featuring its stock ride height, instead serving as a demonstration of the aesthetic enhancements available to Wrangler owners. The changes here are simple—a Jeep Performance Parts hood with a cutout for a snorkel, 5-inch LED lights, a Wrangler Rubicon's black grill, 17-inch wheels, and a concept rock slider. Jeep also attached a fuel door and roof rack from its parts catalog, along with a reinforced spare tire mount. Warm Neutral Gray paint (a concept color) with Brass Monkey and Orange Crush accents cover the entire affair.